When you open your Citizens Community Credit Union REWARDchecking account, you’ll receive a free VISA® Debit Card that allows you to make in-store purchases and access money anytime through ATMs. Our VISA® Debit Card acts like a check, looks like a credit card and makes shopping as simple as a swipe! Funds are automatically deducted from your account, and activity is easily tracked with Online Banking or our free mobile app. You can use your VISA® Debit Card to get cash 24 hours a day at conveniently located cash machines nationwide that display the Shazam, Plus, or Accel logo. Choose Citizens’ ATMs or other ATMs in the Privileged Status network to avoid surcharge fees. For a complete list of Privileged Status ATMs, click here. What do you say when a cashier asks, “credit or debit?” Always answer CREDIT. When you say debit, the transaction is processed as an ATM transaction. You must enter your PIN and that transaction goes toward your daily PIN usage limit of $500. This means you could be declined on a transaction if you have already reached your daily limit. You are allowed 5 PIN based transactions per month at no charge. Each additional PIN based transaction will cost $0.75 + tax. Note: ATM transfers count as two PIN usages and balance inquiries count as one PIN usage. For unlimited non-PIN based transactions per month, specify CREDIT when making a purchase. Present your debit card and specify CREDIT when paying for purchases. You may make up to 40 of these transactions daily for FREE. You have access to all of the available funds in your account. You will not be able to use more funds than are currently available in your checking account. However, if you have outstanding checks or make any cash withdrawals you may still run the risk of overdrafts. Enter each transaction in your check register and keep your receipts. You have more consumer protection rights when used as credit. If you choose credit, the transaction will post directly to your checking account in a few days. Merchants forward your transactions to Citizens, they will post to your account when received. This may or may not be in the same month as the purchase. If you choose credit, you have VISA® return chargeback options available. If for some reason you need to dispute the transaction, you are able to when you process it as a credit transaction. When you choose credit, the transaction is less expensive to process for the credit union. When we save, you save by receiving lower cost services and better savings and loan rates. 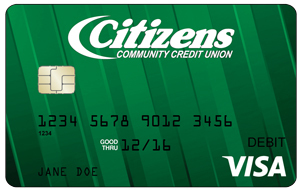 Save your Citizens Community Credit Union VISA® Debit Card for automatic bill payments and online purchases, and VISA will update your payment information automatically when it changes if your card is re-issued. Note: Not all merchants participate in automatic updates. Updates may not be guaranteed before the next billing cycle. If you’d like to opt out of this service, please contact Citizens Community Credit Union or click here to download a form to send in.